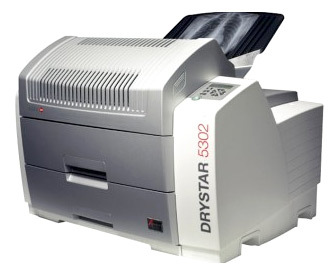 Digital Printer Agfa DRYSTAR 5302 is designed for dry thermographic printing. Dimensions: unpacked (cm): width 72.8, length 71.5 and height 53.6. Standard equipment: hard disk capacity is 18 GB. Power supply: operating voltage: 100-120V; 220-240; alternating current. Main fuses: 220-240V (operating voltage); 16/15 A max, slow blow fuse 100-120V (operating voltage); 16/15 A max, slow blow fuse. Supply frequency 50/60 Hz. Power consumption: during operation 250W, max - 530 W, standby - 70W. Protection: against electric shock Class 1 (grounded), water inflow. Connection to the network environment: Ethernet/twisted pair connectors RJ45 for 10/100Base-TX; serial Interface/cable RS232. Network Protocols: (TCP/IP) FTP, Telnet, HTTP, SNMP, SMTP, LPD. Environmental conditions (operating): room temperature between 10°C and +30°C, relative humidity 20-75% non-condensing humidity. Environment (transport and storage): temperature of -25°C to +55°C (storage), from -25°C to + 70°C (transport), relative humidity of 10-95%. Note: films moisturizing is not allowed! Atmospheric pressure: from 70 kPa to 106 kPa. Image formats: DICOM (built-in), TIFF, and Postscript (optional). Print technology: Direct Thermal printing (DDI: Direct Digital Imaging). Type of film used: thermographic film DRYSTAR DT2 B (blue base) - all standard formats: 8 x 10, 10 x 12, 11 x 14, 14 x 14, 14 x 17 inches; printer has a 2 trays for films of any format with a capacity of 100 sheets each. Print resolution: geometric - 320 dpi; contrast resolution of 12 bits (4096 gray shades at each point); printable area of 8 x 10 inches: 2376 x 3070 pixels, 10 x 12 inches: 3070 x 3653 pixels, 11 x 14: 3348 x 4358 pixels, 14 x 17 inches: 4358 x 5232 pixels. Output: 8 x 10 inches - 140 films per hour, 14 x 17 inches - 75 films per hour; 2 sizes in direct access. Time to first Image: about 77 seconds. Explanation of the information and advertising nature of the information posted on the site.